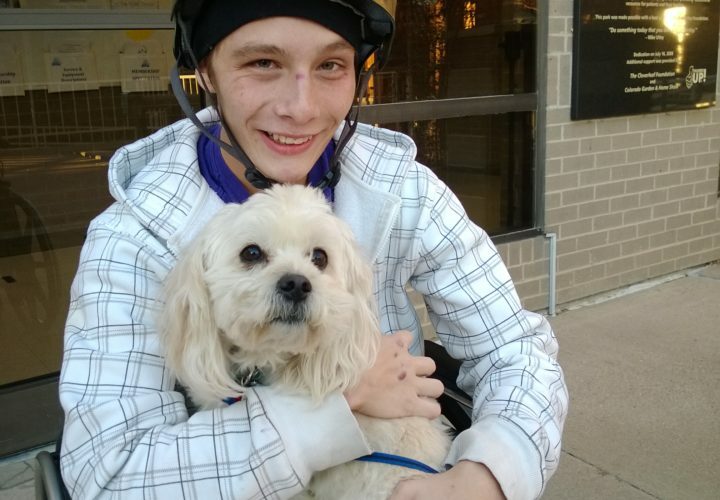 Dustin Hickok, 18, sustained a traumatic brain injury after a longboarding accident when he was 16. The young musician came to Craig Hospital for rehabilitation in 2013. This year he will graduate from the Denver School of the Arts. “Blackbird singing in the dead of night. Somehow his fingers knew the chords and his body knew the song. He may have looked like any other patient after a traumatic injury lying in a hospital bed at Littleton Hospital. He was wearing a hospital gown, his head was against the pillow, and he had scratches on his face. He was not fully aware of what he was doing, but it was in that moment his family knew he was coming back. Their Dustin was returning. He wasn’t looking at them or talking. His eyes were closed, but he was strumming a song on a towel. His mom put a guitar in his hands and he started to play. Perhaps it’s a coincidence that he played “Blackbird.” He always liked the Beatles, but it wasn’t his favorite song. On a rainy day in May 2015, inside the empty auditorium, Dustin smiles underneath the brim of his corduroy fedora. It has been a year and a half since the accident. His hat has become a signature look since then. It covers the scar on the right side of his head. He’s wearing a black bowling shirt, his khakis are cuffed at the ankles, and his Lakai sneakers have blue laces. He looks like a young artist. Dustin started singing when he was 3. He learned to play guitar when he was 7. 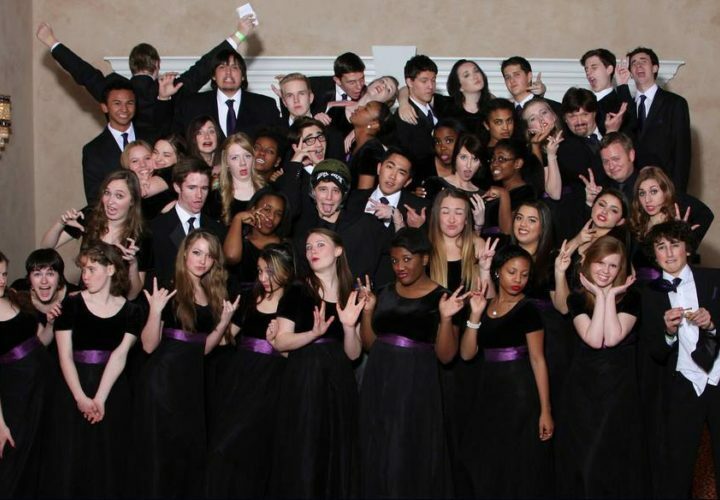 As a vocal major at DSA, Denver’s prestigious school for artists, he learned how to charismatically control a stage. A light shines down on his sunburst Yamaha guitar. It has a shaggy yellow and red strap, with strings that hang over the side. “It’s from Cozumel,” he says. “I went there when I was 14.” He didn’t remember going, though, until his friends told him about it. Dustin softly strums an acoustic, freestyle version of “Blackbird.” It has become his theme song. His voice has a raspy quality that draws you in. He looks young and like a seasoned performer at the same time. “I don’t know why that was the song my body started playing,” he says. 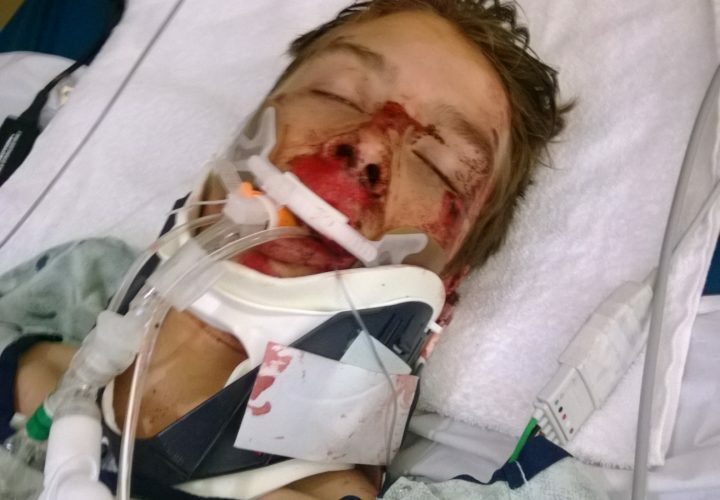 On October 26, 2013, Dustin Hickok sustained a brain injury in a longboarding accident. On that day, Dustin was doing what a lot of teenagers do—he was having fun and being reckless. He was longboarding—riding a long skateboard—and holding on to his friend’s car as his friend drove down a hill. He crashed. When he hit the pavement he broke every single bone on the left side of his face. 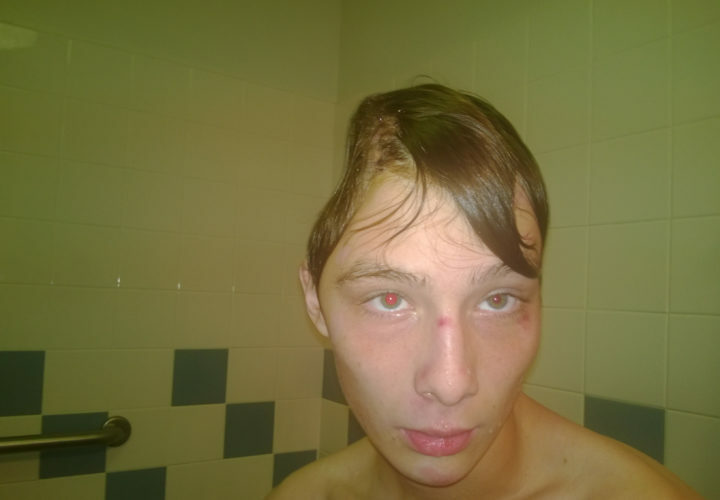 The impact caused swelling on the right side of his brain. He was rushed into surgery and had the right side of his skull removed. “My teeth were okay, except for this tiny chip,” Dustin smirks and points to his mouth. I’ve been working nonstop since October 26, 2013. Dustin doesn’t remember the first three weeks following the accident. The first words he spoke were in Swedish—it was the first language he learned living in Sweden until age 3. Dustin doesn’t remember that part, nor does he remember the day he spoke only in curse words, or the day he rattled off only numbers. His parents made videos and took photos to show him his progress. He recalls how strange it was to realize how much he had missed. He was injured at the end of October, but when he finally began to remember things the date was well past Halloween. The first day he remembers was the day he came to Craig Hospital. He calls this time “rebooting his brain.” Dustin learned to talk and feed himself again. It was a long and grueling process. His guitar remained a constant companion during rehab. He was an obvious choice for music therapy. He wrote and performed a song in the hospital’s cafeteria. He kept up with his schoolwork with Craig teacher Laura Magnuson. 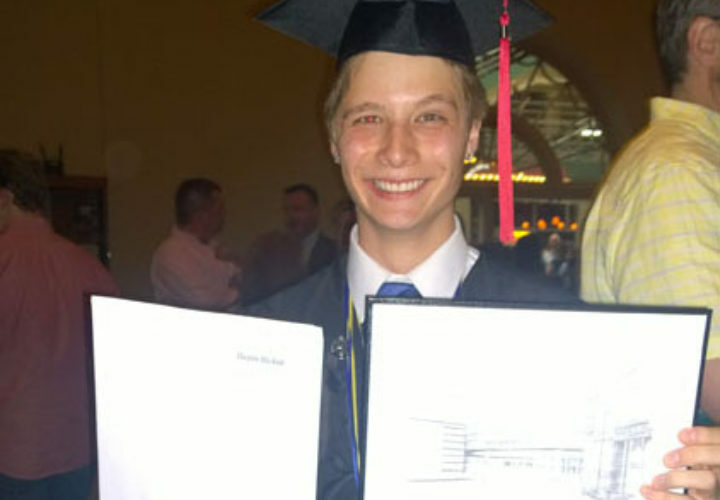 He set a very hard and real goal: going back to school at DSA to graduate with his peers. 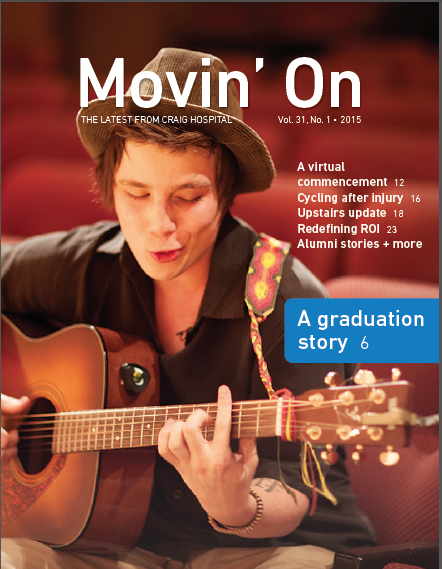 “I am the class of 2015,” he says matter-of-factly. It was this goal that motivated him to work hard in the therapy gym, and later at home as an outpatient. “I’ve been working nonstop since October 26, 2013,” he says. Dustin with his brothers, Philip and Adam, on the first day he came home, December 24, 2013. He went back on a trial basis at first. He wasn’t nervous like you might expect. “I was so excited. That’s why I worked so hard, because I wanted to get back to school, to graduate,” he says. There was a moment on the second day back in school when he knew he was going to make it. While observing a women’s lit class he was able to answer a question based on listening to the class discussion. He hadn’t even read the book, and he got it right. “It made me feel pretty good,” he grins. Dustin graduates with the class of 2015. 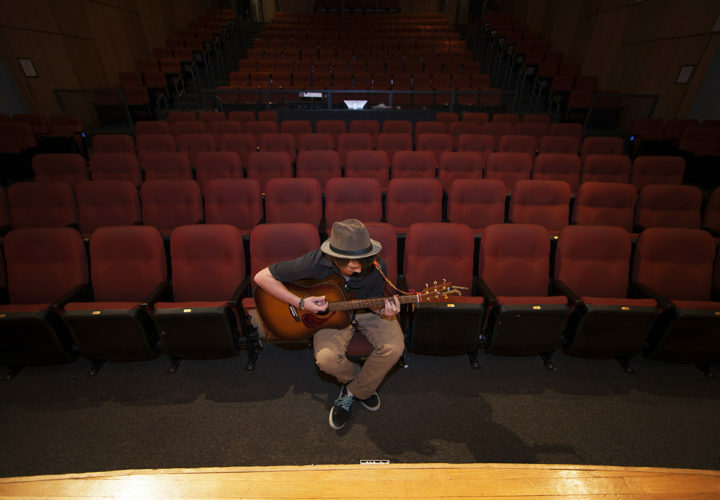 Three weeks before graduation, Dustin plays “Blackbird” in the auditorium at DSA. The song symbolizes everything that has gotten him to this moment. He is close to the finish line. He is going to graduate with his class: the class of 2015. The light hits the tattoo on his left forearm. It’s a daily reminder of his struggles and triumphs. 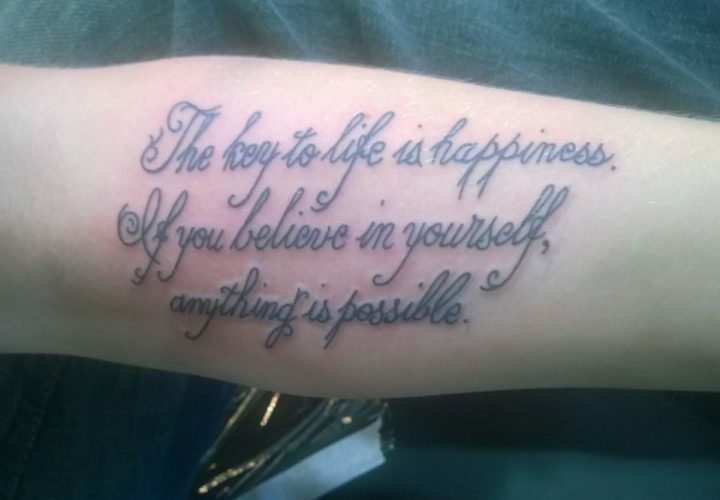 It says, “The key to life is happiness. If you believe in yourself anything is possible.” It’s a quote from Dustin. Something he told his parents during rehabilitation at Craig. After graduation Dustin will attend the University of Northern Colorado. He plans to major in psychology and minor in music. His goal is to become a music therapist. He wants to use his gift to help heal others. Listen to Dustin sing Better Together Cover.